The previous year, the Bronx race in the Five Borough series was a half marathon, but it was shortened this year for reasons unknown to me. The course was fairly simple for the race. Starting not too far from Yankee Stadium, the course had us running down the Grand Concourse for approximately four miles before turning off and looping around Bedford Park before running about a mile on Mosholu Parkway and returning down the Grand Concourse to where we began. Although the course was fairly straight forward, with some inclines, I had two technical issues with my run. The first was that I forgot my iPod and had never run that distance without someone to run with without it. 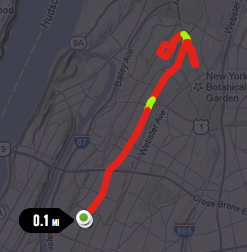 The second was that my Nike+ GPS watch was having issues and did not record my run properly. According to the watch, I ran 0.1 mile over the 1:38:50 that it took me to run the 10 miles. Running 9:53 per mile was a good time for me, and something I could not have done as easily a year ago. With the 2012 ING NYC Marathon a matter of weeks away, I continue to train hard in preparation. The Bronx 10-Mile race showed me how well I’ve come in my training with Team Determination and how much better I will do this year over last year’s marathon. 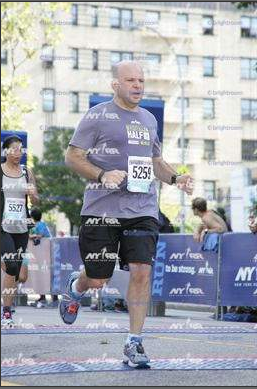 As I continue to prepare for this year’s marathon, races like the Bronx 10-Mile help show me what I will be capable of on November 4 and lead me into my entry for 2013. And if you’d like to support me in my endeavor for this year’s marathon, please donate here to the American Cancer Society and Team Determination.